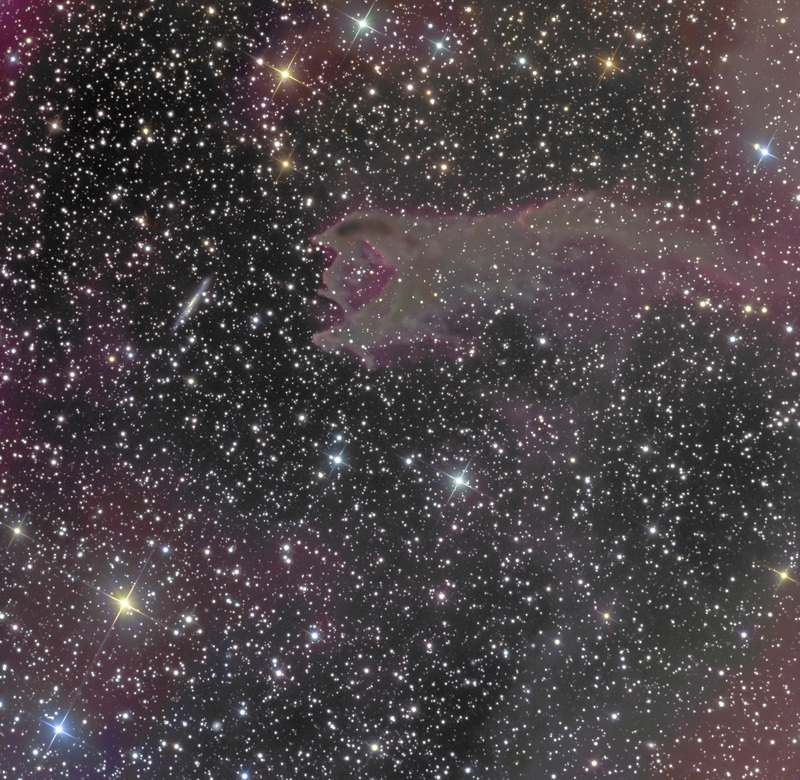 Cometary globules (CGs) are relatively dark clouds with bright rims and faint, extended tails that resemble comets. It is thought that CGs are remnants of larger molecular clouds whose outer regions were stripped away by strong UV radiation from bright, nearby stars leaving just the dense core as a Bok globule. One idea is that the tail is residual material in the shadow of the denser core as it was ablated. Another idea is that CGs arise from the shock wave of a supernova explosion, such as the nearby Vela supernova remnant for CG4. CG4 is one of 38 CGs associated with the large Gum Nebula in the constellations of Vela and Puppis. It’s shape resembles a worm preparing to devour the small, distant, magnitude 14.5, edge-on galaxy, PGC21338 (ESO 257-19). It’s tail, like the other CGs, points away from the Gum Nebula and the bright stars likely to be the UV sources. The distance to CG4 is often stated at ~1300 light years due to the association with the Gum complex, but recent studies of reddening suggest that the distance could be less than half that. CG4 is located in the constellation Puppis at RA 7hr 33.6m and DEC -46deg 55min. This image is 42’ square. North is up. Data were acquired automatically with CCDAutoPilot4, processed in CCDStack and Photoshop CS3. The system was off-axis guided with an SBIG ST-402 on an Astrodon MonsterMOAG and Astrodon Generation 2 LRGB filters were used in the Apogee filter wheel (AI-FW50-7S).